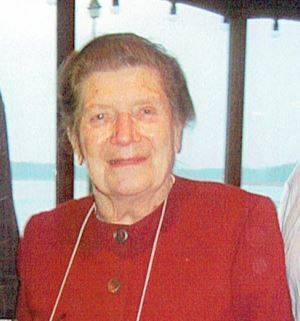 Jeanne le Surf has died aged 88 after being affected by Lewy Bodies Dementia for a number of years and living latterly in a home in New Buckenham. Her life was closely linked with the growth of the Ramblers and walking in Norfolk for nearly 50 years. Jeanne and George married in 1948 and enjoyed country walks around London aided by the Green Line bus service. In 1956 George transferred to the fire service in Norwich with married quarters above the station in Bethel Street. Jeanne and George were appalled at the state of footpaths around the County – little path signage, maps being unclear as to where one could walk. At the time from 1951 to 1958 a Mr Emms was the County Footpath Secretary, trying to co-ordinate what few members the Ramblers had in Norfolk plus members of the Youth Hostels Association in finding evidence for paths which could be put towards Norfolk County Council’s process for deciding which rights of way to add to the first Definitive Maps of public rights of way. After Mr Emms resigned with the Definitive Map still unfinalized, the Southeast Area of the Ramblers (which stretched from Norfolk to Dorset) asked the few people with which it had contact if they would take on the position. Jeanne seems to have been the person who volunteered, and carried on that role until John Harris relieved her of it in the early 1990s. Some of the earliest letters in our files are from 1960 objecting to the deletion of some cliff top paths between Cromer and Sheringham from the Draft Map of public rights of way. Apart from starting to write the walks for the Eastern Evening News in the spring of 1962 (which George proposed in the first place) Jeanne was also thrown into a public inquiry about getting footpaths onto the Definitive Map of rights of way in Salhouse and Horstead that year. It is difficult to judge how many people followed Jeanne’s walks in the Evening News but every now and again there are letters of appreciation in the files. The files of walks also prove useful sometimes when we are asked by the County Council for evidence that might help in a claim for a right of way. Although the walks were weekly, Jeanne and George always had to have several in hand to allow for weeks when they would not be able to go out and survey because of holidays, George’s work, and other commitments. In the early years their daughter Jane would have had to accompany them. Jeanne wrote the walks and George drew the maps for 40 years. With the growth in Ramblers membership the unwieldy Southeast Area was split along county lines in the 1970s and Norfolk became one of the first to be a separate Area, with George elected to be Area Secretary and Jeanne the Area Footpath Secretary. With their example and encouragement local membership continued to grow and our various Groups were set up. The Definitive Maps for the whole County were published in 1965. All the while Jeanne had to examine various proposed path changes and decide if the Ramblers were to resist them or negotiate an alternative. She also had to agitate the County and District Councils for better signage, or to take action against obstructions, usually crops and ploughing. Gradually Jeanne found other volunteers to train as Assistant Footpath Secretaries, and although in other Areas these AF Secretaries were responsible to the various Groups, in Norfolk they reported to an Area committee. Jeanne and George’s homes in Atthill Road and later Armes Street with its garage effectively became the office of the Ramblers in Norfolk, where committees met or volunteers answered correspondence. Jeanne was elected to the Ramblers National Executive Committee in 1983 and in 1984 Norfolk hosted the Ramblers General Council at the UEA. But Jeanne and George did not remain involved in the RA nationally after that. 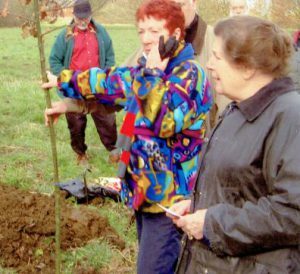 In 1989 Jeanne was appointed by the Secretary of State for the Environment to be a member of the newly founded Broads Authority. This followed a campaign (of which she was part) against the ploughing up of the Halvergate marshes. To promote the Peddars Way as a continuous route through the countryside, in 1981 Jeanne and George set up the Peddars Way Association which continued its work until 1996. Apart from leading walks for the various Ramblers Groups locally Jeanne and George would also lead an annual holiday for the Norfolk Area. Many people remember those. To sum up Jeanne was an inspiration to us all.